The artist: The lineup of Yes has repeatedly fluctuated since the band’s inception in the late ’60s, but one musician—and only one—has played a part in every permutation of the band: bassist Chris Squire. The A.V. Club recently spoke with Squire in conjunction with the release of Yes’ latest live album, In The Present: Live From Lyon, and asked about as many of the band’s seminal tracks as the limited amount of interview time would allow. 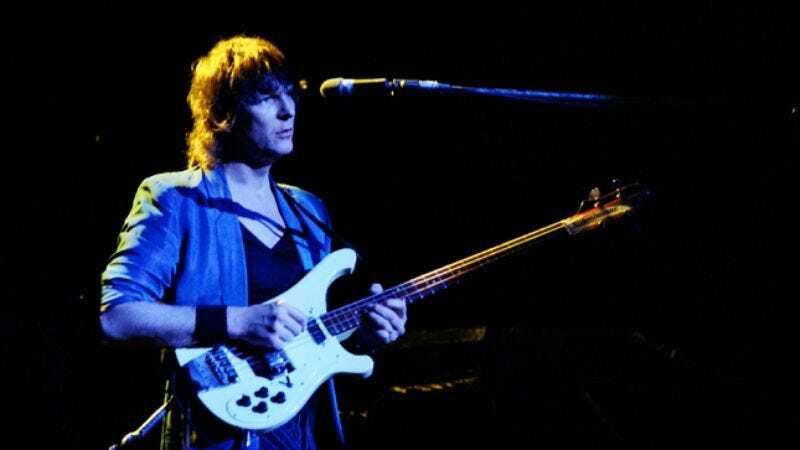 Chris Squire: That originally was recorded in ’69, back on the second Yes album. It was pretty much right when we were starting to write more and more of our own original songs, and that was pretty representative of where our heads were at the time: spacey lyrics and quite hard-hitting playing. We revived it, of course, for touring when Benoit [David] joined the band in 2008. Strangely enough, Steve Howe suggested we do it, and he didn’t even play on the original. [Laughs.] But he thought it was something worth doing, and it turned out great. And we added a little drum feature on the end for Alan [White] that was built into the show. The A.V. Club: It’s the oldest of the tracks on Live From Lyon. AVC: Didn’t anything from the self-titled album warrant revival? CS: Well, I don’t know if we’ve ever really played anything from that album in a long time. I do have a vague recollection of reviving the cover of The Beatles’ “Every Little Thing,” but I don’t know if that was just our riffing on it in rehearsal. I don’t think we ever did it actually in the show. AVC: In a perfect world, you might launch into “Beyond And Before” some night. CS: Yeah, “Beyond And Before,” that is a classic Yes song. Originally written for [the band] Mabel Greer’s Toy Shop, actually, before Yes was even around. AVC: Time And A Word also marked a notable use of orchestra, which wasn’t necessarily a big thing in rock at the time. CS: Yeah, well, exactly. Jon Anderson and I, we really liked a lot of classical music, and we wanted to get some orchestral arrangements going on Time And A Word. And, of course, at that time, I also discovered that guitarists hate it when anybody suggests having an orchestra on anything. [Laughs.] Because it tends, I think, to detract from the art of the lead guitarist. And that also was with Peter Banks, and it was one of the reasons why we actually parted company with Peter Banks after that album. Because he just thought we were going in a different direction from the way he thought. But that wasn’t really the case. We just wanted to use some orchestral arrangements. But anyway, he left after that album, and Steve Howe came in, and then we did The Yes Album. And that all worked out really well. CS: I remember it was the last thing we did [on that album], and it was pretty much put together in the studio. You know, it sort of developed, and… it’s probably one of our first experiments of actually creating in the studio, and that’s why it had one piece Jon had written, a piece that I had written, and a piece Steve Howe had written. And we sort of Sellotaped them together. [Laughs.] Which was a fairly modern technique around 1969 or ’70, or whenever we were doing that. ’70, I think. And of course, you had to have an engineer who was capable of physically editing tape, which was quite an unusual thing amongst studio engineers, because up until then, they’d just been used to taping things in one piece, and that was it, whether it be pop music or orchestral music. But Eddie [Offord] had become good at actually cutting the… probably that was a 16-track. Maybe it was an 8-track. [Laughs.] But Eddie had perfected the art of doing it, so we took advantage of that and started editing bits of music together that didn’t necessarily… We hadn’t played it before we edited it together. And then, strangely enough, “Starship Trooper” became a song that we never, ever played. For years and years and years. It never seemed to be that good in the show. And then I guess sometime in the later ’70s or something, we decided to reintroduce it, and then it turned out to be a really good live song. CS: Oh, yeah, exactly. [Hesitates.] Although, really, everything on The Yes Album is part of Steve Howe’s first effort out there with us. But yeah, he definitely put it out there with his Portuguese sort of mandolin-ish guitar he had. That definitely gave that whole song a sound. And that was also, on the “Your Move” section of the song, our first experimentation with a loop tape, because we just recorded the bass drum and the bass guitar together playing a “duh-dumph,” and we put that on a loop and ran it through a quarter-inch tape machine, and then recorded that again back onto the 1-inch or 2-inch—whatever it was at the time—and then we overdubbed everything on top of that pulse. AVC: It’s turned up in more than a few films and TV series over the years. CS: Oh, absolutely, yeah, I know. And I think it’s even used for a Chase Manhattan Bank ad. AVC: Do you have a favorite use of the song? CS: Ah, well, not really. But, strangely enough, “I’ve Seen All Good People” is, I think, the second most played Yes song on American radio after “Owner Of A Lonely Heart.” And then I think “Roundabout” is third. So it’s definitely had a lot of usage over the years. And it’s still being played. So that’s great. AVC: “I’ve Seen All Good People” and “Roundabout” have both been used on Fringe. Did you guys cut them a deal? CS: Well, of course, by that time, we’d already developed the idea of doing our songs in sections and recording them in sections. So there was the first section, which, once again, had sort of a pulse thing from the bass and drums, and a strummy guitar. Then there’s the middle section I wrote, which is called “Eclipse.” I wanted to make that sound orchestral, and that was also because at that time… well, actually, I think we started on Fragile. When Rick Wakeman joined the band, he brought in the Moog synthesizer and the Mellotron and everything, so those instruments were sort of part of our arsenal then, and we were using them to do quasi-orchestral pieces. Which worked very well for us. Once again, that was recorded in about four different sections and edited together. AVC: The Yes singles of that era… a lot of times, you’d have half a song on one side and half of the song on the other side. Do you cringe when you hear those edits? CS: [Laughs.] Oh, God. Uh, yeah. Yes. But, I mean, at the time, I guess we couldn’t figure out why anybody would want to do anything like that. I guess it was some form of quality control. In a way, I’m sort of happy to think that people would buy something of ours even in that butchered state. It showed they liked the band that much. So in a way, that was good. CS: Well, “Onward” was a song I wrote in Montreux, in Switzerland, when we were there camping out for the whole winter. In the summer, Montreux is a really, really big summertime-touristy, full-of-life kind of place. In the winter, it closes down. [Laughs.] To nothing. So we were doing some kind of a financial tax year where you only could have a limited time in England in order to qualify for certain tax regulations, and it would save you a bunch of money in taxes. So we elected to go to the studio—because they had a studio, to start with—on the lake, and it was a beautiful place. And I actually was living in a rented house that was right on Lake Geneva, which coincidentally was across the road from where [Igor] Stravinsky used to write a lot of his compositions. So it was obvious the vibes around there were kind of good. And I wrote “Onward” there, and it ended up on the Tormato album, which came after Going For The One. AVC: Did you guys have any particular reaction to the punk movement that was going on right around that time? CS: Yeah, I’ve been asked that so many times, and, of course, we were… You know, right around that time—’76, ’77, ’78—we were selling out stadiums in America, so the punk movement was sort of just… We looked upon it as quaint. [Laughs.] So we didn’t think about it very much, really. But I recognize the validity of that now. It was a certain revolution against perceived pomposity, I guess, on the part of bands like us and ELP and Genesis, I guess, to an extent, too. But, you know, we didn’t really notice it that much. AVC: You worked with producer Trevor Horn when he was a member of Yes for the Drama album, but who put you in touch with Trevor Rabin? I remember he came to my house and… [Laughs.] I think we were just drinking and stuff like that, so by the time we went down to the studio—which I had in my basement, which was very sophisticated, actually, and was pretty much like a commercial studio, except I’d had it built under my house—we went and had a jam for about five or 10 minutes, and it was dreadful. And after that, we just said, “Oh, well, okay, let’s just form a new band, then.” [Laughs.] Because we got on very well, so it didn’t really matter what the playing was like at the time. Looking back, it probably wasn’t as bad as all that, anyway.